The overall length of the tubes is approximately 80mm, The capillary portion has an outside diameter which matches the part number (e.g. BGCT 1.5 = 1.5mm) and is approximately 70mm long and closed at the capillary end. 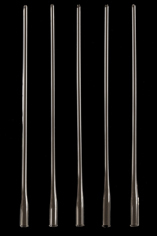 The neck or funnel end is a larger diameter to allow easier addition of the product for testing and is approximately 10mm long. The wall thickness is 0.01mm, being as thin as possible to minimise defraction through the glass. 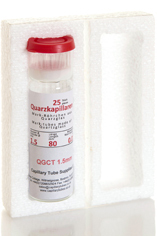 Individual capillary tubes are supplied in an outer glass protective tube. This has a plastic lid, which when removed, shows a foam disc (removed in the image) which sits on top of the open end of the tubes. 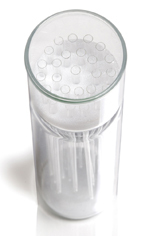 When this disc is removed (as per the image), the individual tubes can be seen supported in a perforated foam disc with individual tubes in each perforation. The outer protective tubes containing the capillaries are housed in custom polystyrene moulds, forming an upper and lower layer sandwich. These moulds are then packed into cardboard cartons, infilled with polystyrene chips for shipping.